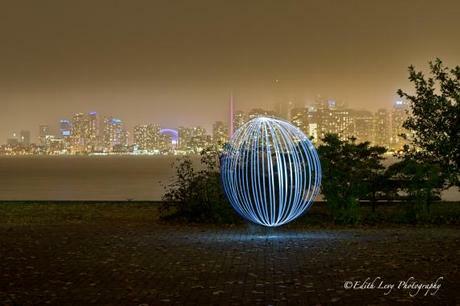 After an evening of shooting the Toronto skyline during Denise Ippolito’s workshop we decided to have some fun with light painting. This is something that I’ve always wanted to try and we had a blast experimenting with this technique. We hadn’t planned on doing this but putting on our “MacGyver” hats we used a small LED flashlight I had in my camera bag and the string from Denise’s hoodie to tie to the end of the flashlight. Denise’s friend and fellow photographer, Lynn slowly started twirling the flashlight on the string and turning in place slowly. After a bit of trial and error this was the result. By the way Lynn is actually in the middle of that circle of light but because she was slowly moving you can’t see her at all during the long exposure. I posted images of the skyline on Monday (you can see them here) as the fog started rolling out. Notice the skyline in the background. The CN Tower was starting to disappear again as the fog rolled back in at the end of the evening.